I shared with you last week that Thanksgiving was threatening to overwhelm me, but I was really in denial about what would come before the leftovers were even all gone. The “commercial” Christmas season has come roaring in, practically running down Thanksgiving in its wake. Not that it hasn’t been around since before Halloween, but this week has brought a new level of frantic Christmas messages. Neighbors have lights and greenery and blow-up snowmen out on their lawns. I still have pumpkins on my front porch and feel a sense of camaraderie with others whose front porches are still decked out in Thanksgiving decor. The catalogs are screaming with deadlines for shipping in time for Christmas. My inbox has became an unmanageable beast shouting about Cyber Monday deals and extended Cyber Week sales and last chances and one-day coupons and so much more that my head is spinning. Exactly when did Cyber Week become a thing anyway? I got an email from a big crafts store yesterday with a list of one-day deals and a lead-in sentence that said: “This year, take the stress out of the holidays by simplifying your DIYs …” The sale was for ribbon and fake poinsettias that I could use to transform my normal (read: boring, blah, unacceptably plain) chairs into appropriately festive ones with perfect chair ties. I thought to myself, “Hey – I know. I’ll make my holidays even less stressful by not going to the store and buying festive-chair-tie-making materials.” I also convinced myself I did not need “Celebrate It pre-lit entryway trees,” even if they, too, were marked down 60% for one day only. Whether I prepare and decorate and learn how to bake the perfect pie … or not, Christmas is coming. I want to get my heart right for it. I’m determined to find some quiet in this Advent season, to carve out some space for preparing for real Christmas. And I think the nativity scene is the perfect place to look. These nativity shepherds look so calm and happy and relaxed. That’s how I’d like to be this Christmas. 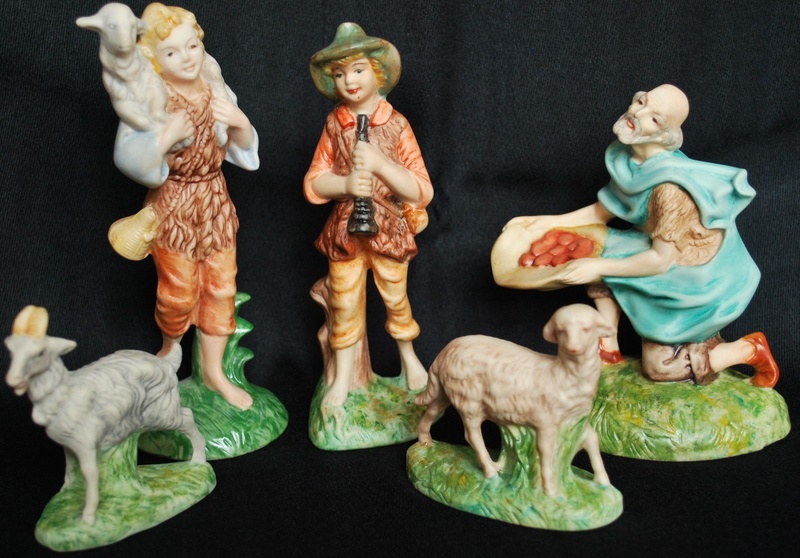 I wrote a bit last Christmas about the nativity set my mother painted for me, and these are the shepherds from that set. Stop and look for a moment at their faces and what they have with them: a few of their animals, a water canteen, a musical instrument and some food. That’s all. When they heard the angels singing of Christ’s birth, they didn’t rush around looking for ribbons and fake poinsettias to decorate their chairs. They rushed to the manger and brought only what they already had with them. Friends, will you take a cue from the shepherds this week and drop what’s not important so you’ll have time and energy and joy for what is? Are you willing to set the Martha Stewart expectations aside and prepare your heart and home for the presence of Jesus? Got a good tip for how to make the coming celebration a simpler one, less filled with stress? Please share it below! This entry was posted in flourishing tree and tagged Advent, calm, Christmas, holiday stress, Jesus, joy, less stress this Christmas, nativity, shepherds by hopesquires. Bookmark the permalink.